Most people know how to cook rice and different countries or regions have slightly different ways of preparing it, I cook it Ecuadorian style because that is how I learned to do it and I think it tastes great this way. Nicolas sometimes cooks rice the way he learned in Japan: boil the rice in a lot of water (very similar to how pastas are cooked) until it is done, drain it and that’s it. The Ecuadorian way of cooking rice is a little bit different and more precise; the rice should be perfectly cooked, not too hard, not too soft, firm and grainy. Depending on where you live and the rice you buy you might need to sort through the rice to remove any bad ones or small rocks, and in that case you probably also want to wash and rinse it well, also if you live in altitude you’ll probably need to add more water and let it cook for a little bit longer, I currently live almost at sea level so I use the minimum amount of water, but when I lived in Loja (2100 m or almost 6900 ft) I would use about double the amount of water to rice. A lot of Ecuadorian main dishes use arroz amarillo or yellow rice as a side dish, this is cooked the same way as below, just add ground achiote or annatto seed when cooking the onions. You can add paprika or saffron if you don’t have achiote available. Heat the oil or butter on medium temperature in medium sized saucepan. Add the minced onions and garlic (and achiote if making arroz amarillo or yellow rice), cook until the onions are translucent or soft, about 2 minutes. Add the rice and stir it in so that it is well coated by the oil, add the water and bring it to a boil. Let the water reduce until it barely covers the rice, cover with a lid, reduce the temperature to low, and cook for about 20-25 min. I am from Portoviejo, Ecuador. I love cooking always did since I was a little girl. Even though we always had a cook at my house growing up I was always in the kitchen helping out and cooking with recipes from books. Now I live in NYC and I have 3 kids and 2 grandsons. They all love my cooking, my daughter’s favorite is my shrimp ceviche. Thanks to you I made fish encebollado for the first time and loved it, I didn’t even tried it in Ecuador when I lived there. I have made it 4 times already and everyone loved it so much even American friends. I have also used other of your recipes to cook, like shrimp and rice, aguado de gallina. One of the things I missed the most from Ecuador is the gastronomy, nothing compares it for me, no even the fanciest restaurants in NYC. My fiance is from Russian and he absolutely loves Ecuadorean food, he says he can eat ceviche every day LOL. I am going to use your fish recipe today using halibut, I like the texture is similar to the corvina, which I am unable to find in NY. Anyway thanks so much for your recipes! Hello! I lived in Ecuador (Quito) for over a year, and I’m so happy to find a recipe for the type of rice they always served on the coast. I can’t wait to make this along with your encocado recipe (encocado is one of my favorite dishes ever). Also, you wouldn’t happen to have a cazuela de mariscos recipe on this site, would you? Thank you for posting such delicious recipies. I love that you include pictures of what I should be doing. I have never cooked Ecuadorian food and my hubby, from Guyaquil loves it! Muchisimas Gracias! A recipe about Ecuadorian rice, and no mention of the cocolon? Ha ha ha! I loved living in Ecuador, and I love this blog. Thank you! I came across your site a while back during a simple web search for Ecuadorian recipes. And it remains my main go-to site for resources. I was born in California, while my mother is from Quito, Ecuador. Ecuadorian food was a common staple in my childhood years and I never learned how to cook it. Today I am married and living on the other side of the country and oftentimes finding myself so nostalgic. I occasionally call my mother for cooking tips, but decided to start looking for recipes online for easier access. I was overjoyed to discover old dishes that I haven’t seen in years and finally have a name for them! I haven’t started cooking anything yet due to the morning sickness brought on by my pregnancy. But I am madly craving Ecuadorian rice as my mother made it. I can’t wait to get started on it soon! Thank you for sharing such a wonderful site. Keep it up! My boyfriend is from Florida but was raised in Ecuador. He loves my cooking, but since I’m from Texas the extent of my knowledge in the kitchen is limited to American, Mexican, and Tex-Mex. It’s a nice surprise to find a site that offers something that hits a bit closer to home for him. I’m sure he’ll be surprised to find out I’ve found new recipes. Thanks so much. My wife and daughters are Ecuadorian and they are coming to live here in England with me shortly. I’ve searched and searched for similar rice varieties to those I used to buy in Quito’s Centro Historico (where I used to live). Using this recipe I’ve just used standard white long grain rice from the supermarket but managed to get that proper authentic taste back….. now just looking for chochos, peeled corn and ripe fruit. My wife will be very chuffed thanks! If you live in London you can find chochos in Elephant and Castle and Seven Sisters. Good luck! I’m so enjoying your recipes! My husband grew up in Quito – his father was from Ambato – and he often comments on how much he misses Ecuador. I can’t wait to surprise him with some tasty memories of home. I bought goat meat for the first time last week as I am adventurous and wanted to try it. I stumbled across your recipe while looking for goat recipes and I am thrilled. I too went to Ecuador the year before last and loved the food there. I have a cookbook from Quito but hadn’t tried anything since. Right now this recipe is simmering on my stove – tommorrow with the rice and plantains – Thank you so much! I get so busy looking at the beautiful pictures of food that I hardly have time left to cook–but when I do, I just love everything I try! Thank you so much. How do you get the individual portions of rice toturn out in such neat little shapes? Hi Beth – I use a ramekin or just a cup as a mold, stuff the rice inside and then place it on the plate and remove the mold. I am so happy to find these recipes. I will make ” Fish with coconut sauce” for a good friend this week, wish me luck lol. My grandmother, my mom and my aunt are amazing cooks and now that I am not in Ecuador I miss their food. I am loving your website…cheers! I love everything this website has to offer. I too found it because I was looking for emanadas Argentinian also!! My boyfriend is Ecuadorian and I wanted to suprise him with food from his country. I have two questions, will you be adding more to this site and in the rice recipe above I didn’t see garlic until it said to add it with the onions. I wanted to know how much garlic it called for. Hi Lee – Sorry about the garlic confusion, it’s optional, sometimes I add and sometimes I don’t, when I do it’s just 1 clove. This is the best website I have every found. My husband use to live in Ecuador and for our honeymoon he took me to Guayaquil, Banos, and Salinas. We love this country so much we visit it every summer for one month. We always try to recreate ecuadorian dishes but can never find great recipes. Now we found them, thanks for all the great recipes. Cooking them brings back a lot of memories. Thanks so much! I used to make this rice with a friend of mine and couldn’t find the recipe before – Thank you so much! I am so excited to try this tonight and impress my friends with it! Soy una ecuatoriana viviendo en Cambridge, encontre tu blog y me parece espectacular. Debo decirte que eres como una ecuatoriana mas, tu forma de cocinar, tu forma de hablar, cuentame si vivo en Boston cual crees que deberia ser la cantidad de agua, este fin de semana hago un almuerzo a la ecuatoriana y hare arroz con menestra. Hola Emilia – Si vives en Boston usa la cantidad de agua de la receta (2 1/4 tazas), suerte con el almuerzo! Encotre este blog por accidente, y me parece espectacular, Soy Ecuatoriana y vivo en USA desde hace muchos mucho tiempo, las recetas en este blog me ha hecho apreciar y saborear la comida de mi tierra de una manera sin otra igual. LOVE IT!! Thank you so much! no puedo esperar otraz para empezar seriamente a cocinar. of Ecuadorian cooking and spell it out for us good cook wannabes??? Thanks. I just got back to the US from two weeks in Ecuador with my son. While in Loja, we were treated to the arroz amarillo with shrimp, and it was delicious. Thanks for sharing your recipes. I found this blog looking for “empanadas argentinas” and in my search it promt me to your Blog, LOVE IT! !, and got stuck looking at all your recipes. 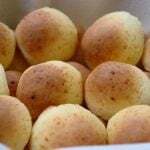 I’m from Venezuela and I have a passion for food, especially the ones that can take me back to my lovely country….and childhood. Love that you include the pictures (I like to see how a recipe would look like and the process of it). Fortunately for me I’m able to find a lot of “our” stuff from South America here in Kansas, so I plan to make some (if not All) of your recipes. I grew up in Quito and Pasochoa. Blair, Thank you for the kind words, I’m so happy that you like the site, I think there are so many great dishes in Ecuador (and South America) that aren’t that well known to the rest of world. What part of Ecuador did you grow up in? What a fabulous surprise to come across this blog! I am delighted and overjoyed. I was born in Colombia and grew up in Ecuador… I now live in the USA and I miss the Andes and its glorious food traditions (I would include the coast here too) so much. Thank you, this brought me joy. 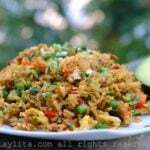 Laylita, thank you for your reply to my rice question; I see you also posted the recipe. I am trying the white rice tonight to be served on a bed of your lentil stew accompanied by butterflied grilled chicken breast. Hope it will be a winner. Thanks!